There are two major aspects of living in a Vanagon that appealed to me. One, the shear adventure of being able to roam as desired. The second is the freedom of living simply. The past year I had lived in a tiny house I helped build in Terrebonne Oregon, and at 240 square foot, the place felt quite a bit bigger than necessary. The next logical step, take it to the road and move into 75 square feet. Part of living simply, for me at least, is being as self reliant as possible. A huge part of this was being able to charge my electronics without having to plug the van in somewhere, or sitting at coffee shops for hours while all my gadgets get juiced up. 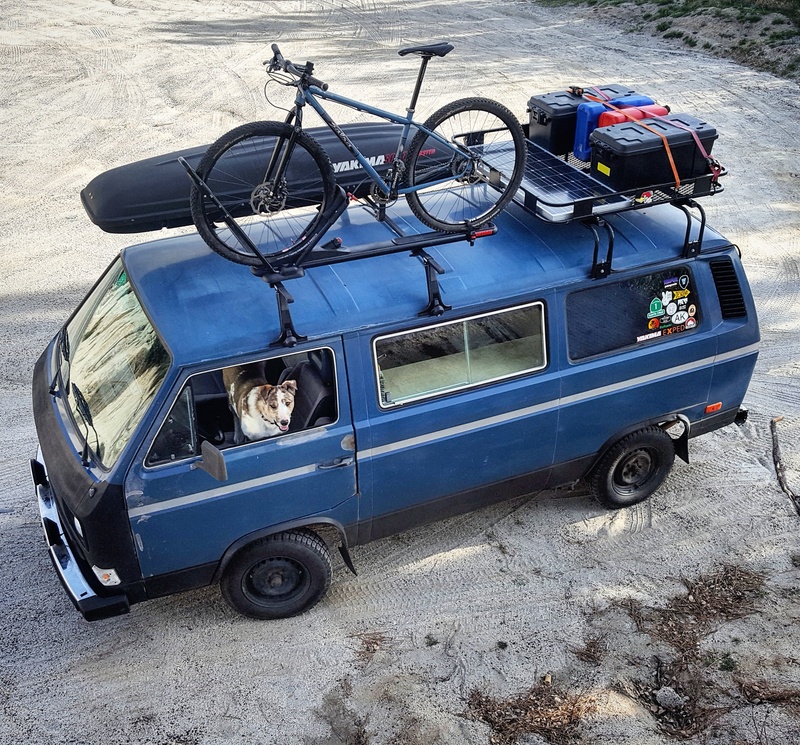 I think the feeling of freedom that comes with living in a Vanagon would be greatly compromised if I still had to travel from plug in to plug in, always worried that my laptop would die in the middle of an important project. Beyond that charging all the gadgets is not the sort of pile one wants to drag into the coffee shop every day. My needs for power are fairly few. There is no microwave or electric heater in this van, just the electronics that enable me to live this way. As a photographer, that includes my laptop, camera, and a mobile phone. So far, two months in, I have found that 100 watts has been plenty. There are a lot of companies out there, seemingly endless, that make the panels. Two companies I had heard of and heard positive things – Renogy and Goal Zero. Goal Zero, as best I could tell, was sort of a standalone system, using their power pack/inverter. What I wanted was something that could integrate into the cabinets to give the feeling that it was part of the build, not some add on. Renogy and their adventurer system fit the bill. When I built my cabinets I knew I wanted a flush mount charge controller next to the rear bench, and eventually it would be accompanied by some USB outlets and likely a shore power outlet. For this I recessed that panel of the cabinets. The Adventurer controller from Renogy, I believe, is their only flush mount controller. This feeds into my Exide AGM deep cycle, which is a little smaller than the Interstate I used last time, but is sealed and so far, two months in, it seems to be plenty. That then is wired to a Renogy 500 watt pure sine inverter. Not sure if it is still the case, but I had heard some years back that modified sine, the usual/cheaper inverters, can damage sensitive electronics – like a laptop. Not willing to take a chance, pure sine was a simple choice. I am really pleased with the system so far. I will post again once I am 6 months or more in, to share any lessons I learn about the system, or size/storage.